Use a Dowel Plate to easily make exact-sized dowels from any wood you choose. Also useful for making precise tenons on chair spindles. 51/8" long x 1½" wide x ¼" thick, made from surface ground A-2 Tool Steel, hardened to 60 Rc. Holes are machined with a 6° clearance taper on the underside. Holes are straight for the first .025", allowing you to sharpen them without affecting the hole size. Start with pieces whittled close to your desired diameter, chamfered at the leading end, and hammer it through the appropriate hole for perfectly sized dowels. Includes two mounting holes for No. 10 flat head screws. 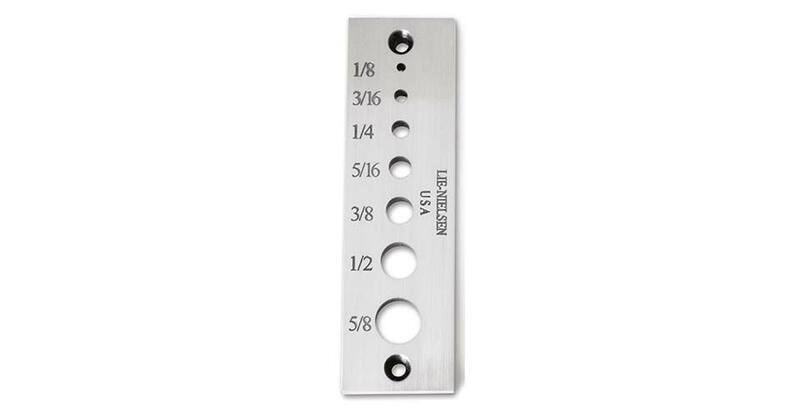 Standard Dowel Plate makes 1/8", 3/16", ¼", 5/16", 3/8", ½", 5/8" dowels. Metric Dowel Plate makes 3, 4, 6, 8, 10, 12 and 16mm dowels. Use: A dowel plate is very handy for accurately sizing dowels from any type of wood you choose. It can also be used to create a tenon on the end of a piece such as a chair spindle. Short pieces are easier to handle, but any length is fine. When making your own dowel, get as close as you can to the correct size with a plane, spokeshave or drawknife. The blank does not have to be very smooth, though — small facets will disappear quickly. A bit of experimenting will tell you how close to make your blank, depending on the type of wood, length of dowel and how smooth a finish you desire. Chamfer the leading end of the blank with a knife to make it easy to start the cut. Hammer the blank through the hole. You can also use it to size purchased dowels. Mount the Dowel Plate with wood screws over a series of relief holes in a bench, or clamp it over a dog hole for temporary use. Materials: The Dowel Plate is 5/16" A-2 Tool Steel hardened to Rockwell 60-62, cryogenically treated and double tempered. Maintenance: If the Dowel Plate ever needs it, hone the top cutting surface with water stones to sharpen. Keep oiled to prevent rusting.